3 entries categorized "Bars: Bix, San Francisco"
We here at Bibulo.us frequently lament the movement toward excessively large cocktails. By the time one gets to the bottom of one of these nine-ounce monsters, the drink has inevitably reached room temperature and the drinker's blood alcohol content has inevitably reached "slushy." And so it warmed our hearts to see that someone had supported our observations with data. A study to be published in September in a the journal Alcoholism: Clinical & Experimental Research shows that the total ethanol content of the average Northern California cocktail is 42% greater than a "standard drink". (A "standard drink" is defined as 0.6 ounces of pure ethanol, which is found in about 1.5 ounces of spirits.) The paper itself is hidden behind a pay wall, but a little math shows that the average cocktail has about 2.13 oz of 80-proof spirit in it -- so once you add that lemon juice to your lemon drop (doubling the volume) and shake it with ice (adding 25%), we're looking at almost five and a half ounces of liquid. So the average cocktail in the Bay Area must be served in a seven-ounce glass (so it doesn't slop over the side). This finding jibes with our anecdotal evidence. While there are outliers on the properly-sized side (we've often had outstanding 3.5-oz drinks at Absinthe or Bix) and on the vat-of-booze side (but we go to Martuni's anyway), most drinks are, well, just a little bit too big. As the study's authors point out, The Incredible Expanding Cocktail has more serious effects than inflicting lukewarm cocktails on an unsuspecting public. People have a hard time knowing how much they've had to drink when "a cocktail" at one establishment equals three cocktails at another. 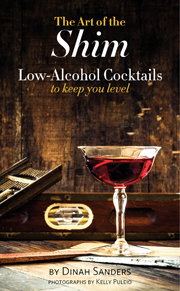 So if you don't regularly bring a graduated cylinder and a hydrometer along with you to the bar, take our advice: have another cocktail, and take the subway home. This stylish supper club feels like it's been gracing quiet Gold Alley in San Francisco's financial district since the 1930s and 40s it evokes, but it's only been around for 20 years. That's not unheard of for a restaurant, but what is extraordinary is that the two original barmen, Bradley Avey and Bruce Minkiewicz, still preside at the beautiful bar, white-coated and ever-ready hosts. Bix is a class act. Crisp, bittersweet, refreshing. Remarkably, also a simple recipe and therefore possible to walk most any bartender through making this apertif. It's just that simple, but sometimes it takes a firm hand to keep them on track with those equal proportions. The bibulo.us authors particularly recommend Martin Millers gin and Carpano Antica Formula vermouth for this libation, particularly if you can get Bradley Avey of Bix in San Francisco to mix it. According to the Negroni's Wikipedia entry, though it is said to have been invented around 1919, the Negroni does not appear in English cocktail books until 1947, but it neglects to mention which book(s) it then shows up in. Harrington advocates for an orange slice garnish rather than a lemon twist, to offset the bitterness of the Campari. David Wondrich's 2002 Esquire Drinks generally agrees with Harrington's assessment, but takes the interesting variant of calling for half-again as much gin (1.5 oz) and an orange peel garnish. Dale DeGroff's The Craft of the Cocktail, from the same year, agrees with Harrington but flames the orange.